Together with her sister ship, Tirpitz, the Bismarck was the pride of Hitler’s navy, and was viewed with alarm by the Royal Navy. Launched in February 1939 and completed in August 1940, she underwent sea trials in the Baltic and in May 1941 she sailed in company with the heavy cruiser Prinz Eugen to attack Allied commerce in the Atlantic. 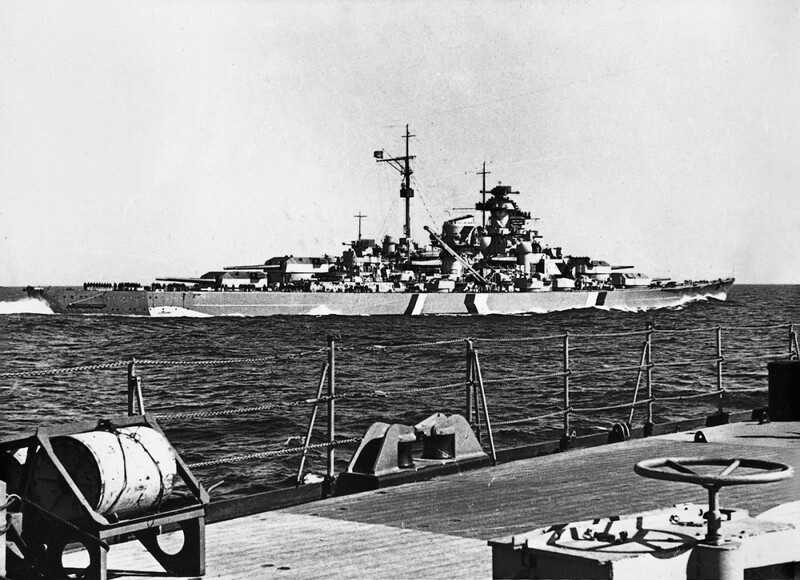 Detected by British aircraft, the German warships were intercepted by units of the British Home Fleet in the Denmark Strait, between Greenland and Iceland, and a running battle developed during which the Bismarck sank the battlecruiser HMS Hood and damaged the battleship Prince of Wales. Hits on the Bismarck reduced her speed, though, and produced an oil slick in her wake. On 26 May she was attacked by Swordfish aircraft from the carrier Ark Royal; a torpedo hit destroyed her steering gear and rendered her unmanoeuvrable. On 27 May she was shelled to pieces by the battleships King George V and Rodney, her crew resisting until the last. Finished off by torpedoes and gunfire, she sank some 480km (300 miles) northwest of Brest with the loss of 1977 officers and men – a grievous loss to the German Navy. Half a century later, her wreck was photographed by a miniature submarine.